5:00 am with coffee in hand we crept out of the house in the dark leaving Bozeman Montana for a Jackson Hole Wyoming mountain bike trip. 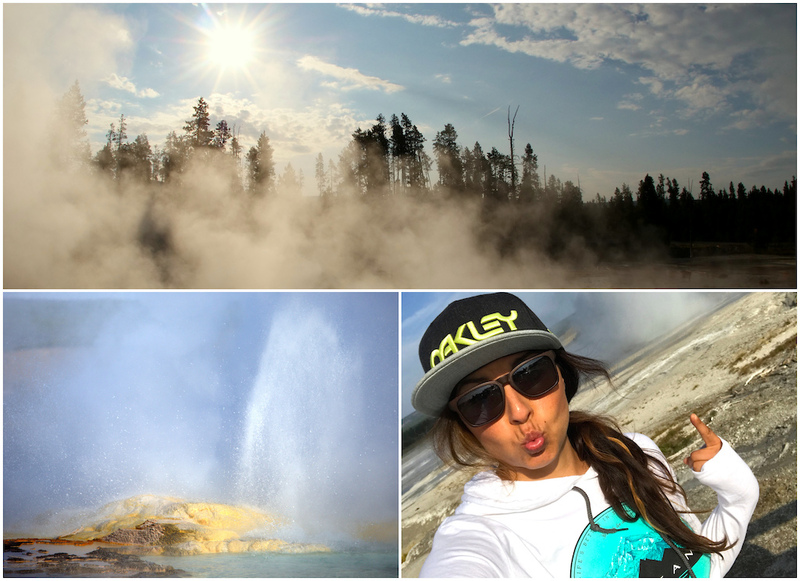 Our route was Yellowstone to Grand Teton National Park, and then on to Grand Targhee Resort to catch a few afternoon laps. 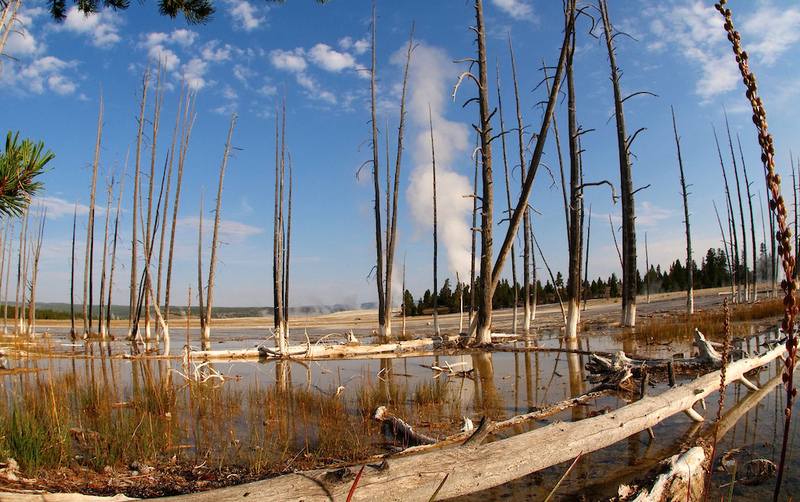 Driving through Yellowstone is truly a party for the senses, with valleys full of steaming geysers, bubbling and spouting up as far as the eye can see. We basked in the morning light and took it all in with anticipation mounting for our first glimpse of Grand Teton, one of Wyoming’s many magnificent mountains that juts out of the Jackson Hole Valley, high above the Snake River below. 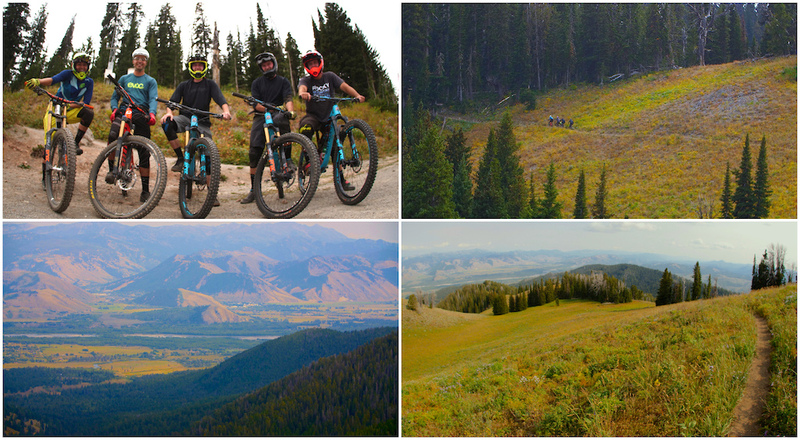 As always, those views never disappoint, and just a few hours later we would be on the other side of this mountain riding our bikes along the flanks of the craggy beast at Grand Targhee Resort. 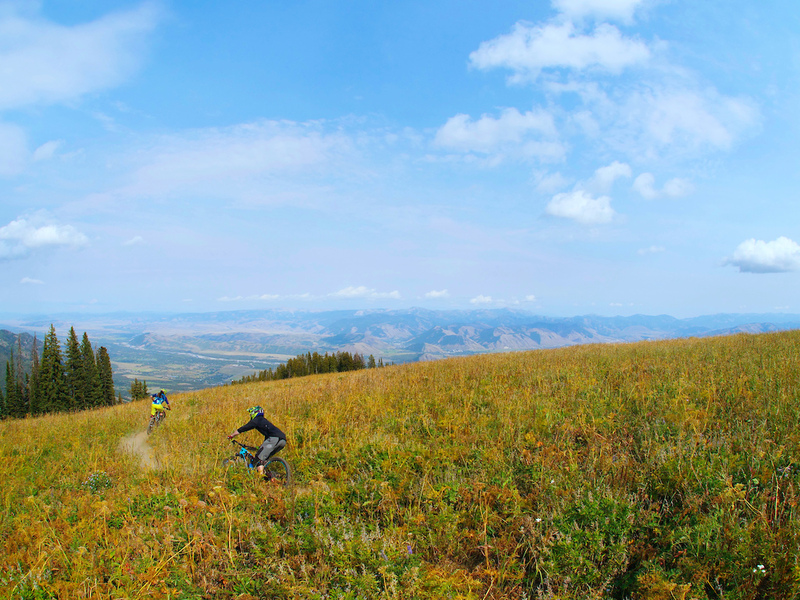 But first let’s talk about Jackson, at 6237 feet above sea level, Jackson Hole is perched at the base of Grand Teton, and is nestled into the heart of the Rocky Mountains making it the backdrop for all things epic, including mountain biking. 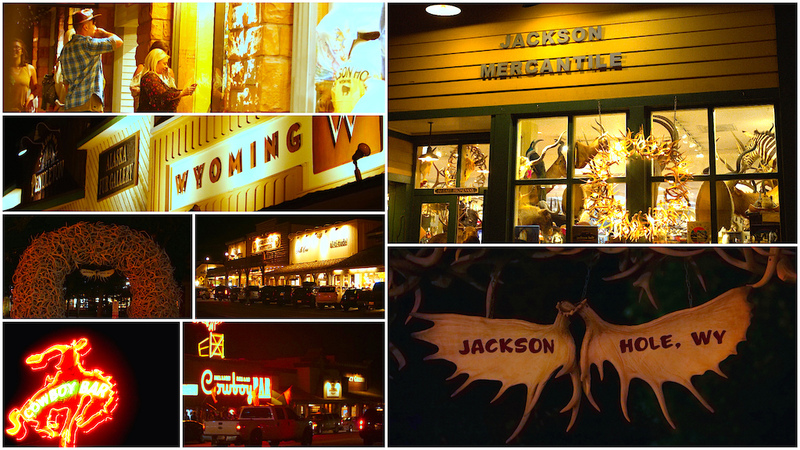 Jackson Hole Valley spans some 60 miles, with Grand Teton and Yellowstone park just to the North and the Gros Ventre and Wind River Mountain Range to the South. With all these mountains come endless trails and ‘pinch me’ views. Unfortunately this particular trip, the views were a little clouded by smoke, but I believe it’s worth noting this happens every several years or so during an especially busy wildfire season like the one we just experienced. The Tetons hold a very special place in my heart as I was born in Jackson Hole and grew up nearby. I always look forward to revisiting this magical place and it seems to never lose its western charm, hospitality and breathtaking views. With an elk refuge up the road, mountains in every direction, cows, horses, wildlife and log cabins are a bit of a theme here. You get that feeling that everything is as it should be in Jackson. There are still trucks and horse trailers parked along the road in the town square, where the Wrangler jean, cowboy hat wearing driver is most likely posted up on a barstool in the local bar rustling up a beer and burger after a long day in the hills. Town Square in Jackson is always bustling with life during the summer and winter months. Tourists wander the streets, most overwhelmed by the shopping, good food, galleries, and of course the antler arch and horsedrawn stagecoach clopping along the streets are crowd favorites. Since our trip was a short one though, there wasn’t much time for town, and we were off to hit the trails! 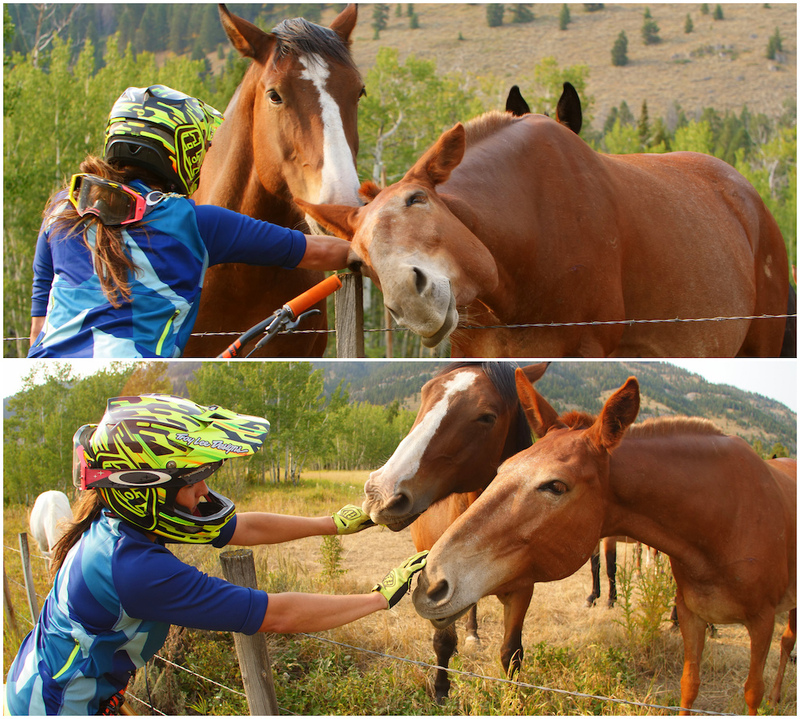 Getting to the know the locals between shuttle laps. 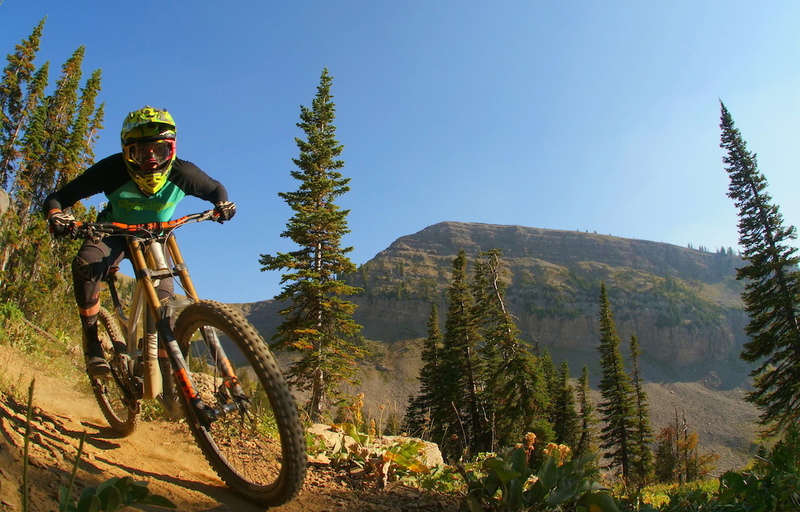 Teton Pass is well known in the Rocky Mountain downhill/ freeride scene. 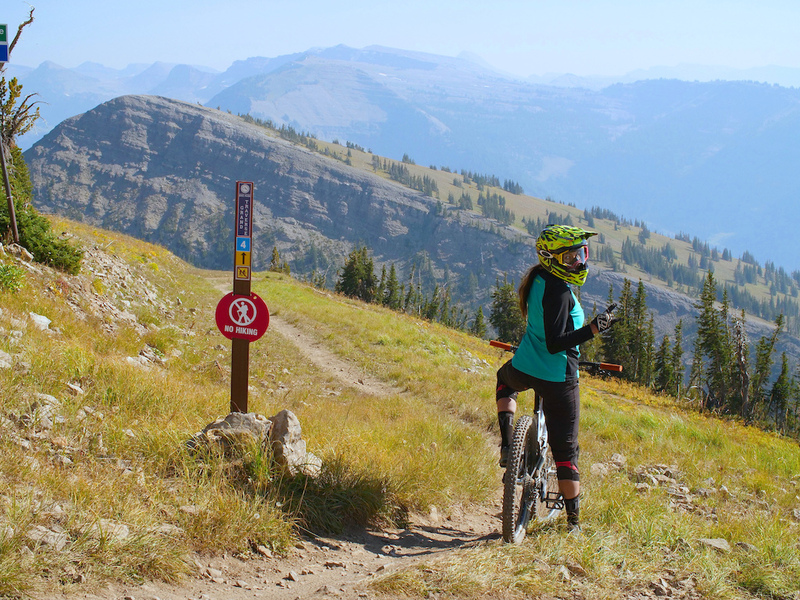 With Teton Freedom Riders non-profit organization behind this trail system, it’s an assurance in not only building new trails and maintaining old ones, but also in the future of mountain biking in this truly breathtaking zone that overlooks the valley floor below. Park at the top of the pass and choose your own adventure on the way down. With a paved 10 minute shuttle, one could easily get multiple laps in a day. 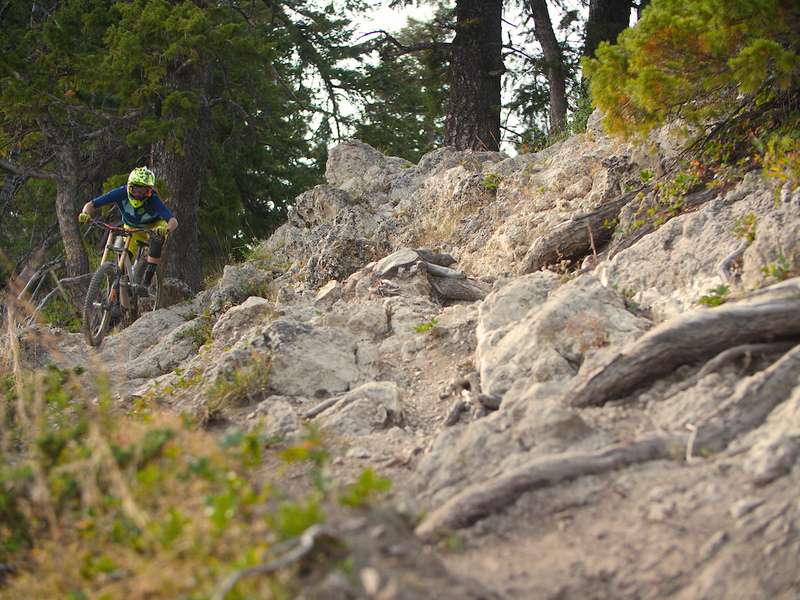 Lithium (shown above) is my personal favorite of the Teton Pass trails with its fast singletrack through the grassy meadows that winds its way down to some technical downhill bits, jumps, and finishes with some tacky flow through the aspens trees. Fuzzy Bunny and Jimmy’s mom also top the list of greatness and there is obvious trail signage and even a map at the top making it hard to get lost. After a hot day, cold day and all those days in between, the Stagecoach bar at the bottom of the pass is your one-stop shop for liquor, beer, and some western bbq grub. There’s also some nice memorabilia plastered about that serves as a good reminder folks around here have been riding buckin’ broncs long before the days we thought our bikes wanted to buck us off. 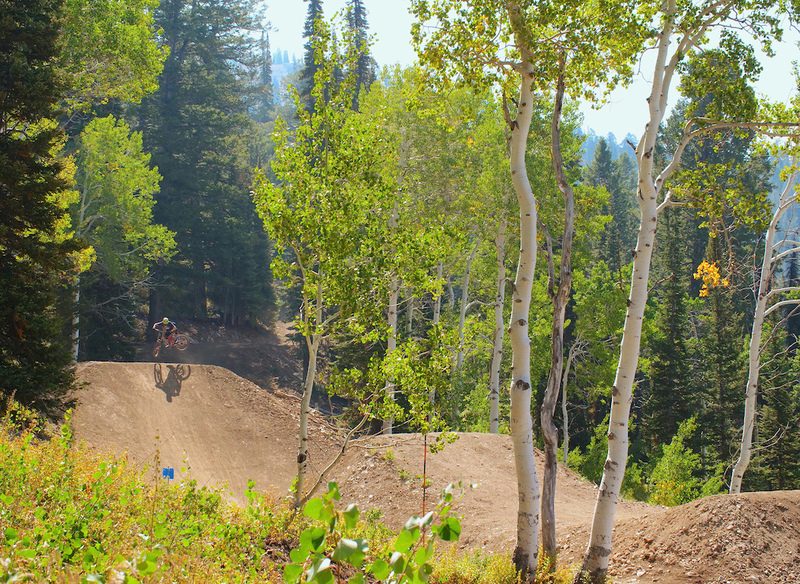 Across the street is the Teton Gravity Research headquarters, as well as Wilson’s Backcountry Bike shop. These guys will happily help you out with trails to ride and also rent bikes if you need. Jay Provins gets sideways on Astro. For our 3 day trip we came equipped with downhill bikes, although trail bikes would also be a great bike choice as there are multiple spots to ride XC loops. 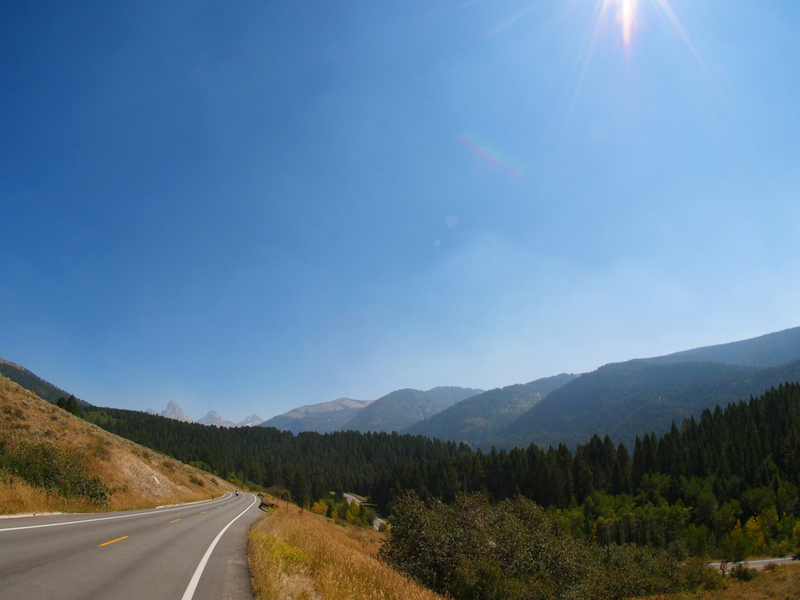 We focused our trip between Teton Pass and Grand Targhee Resort, located in Alta Wyoming, about a 45-minute drive from Jackson. 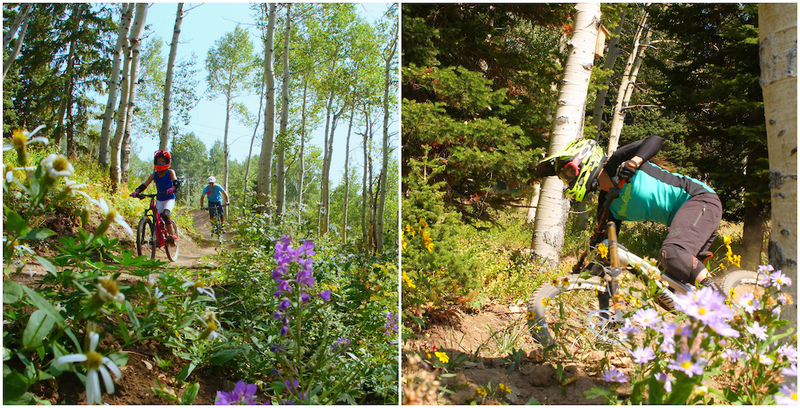 It features over 60 miles of trails catering to XC and downhillers alike. With a base at almost 8,000 feet and summit at nearly 10,000 feet, it’s a good idea to pack a spare tube and jacket for the chairlift ride to the top. Weather in the alpine can be unpredictable. 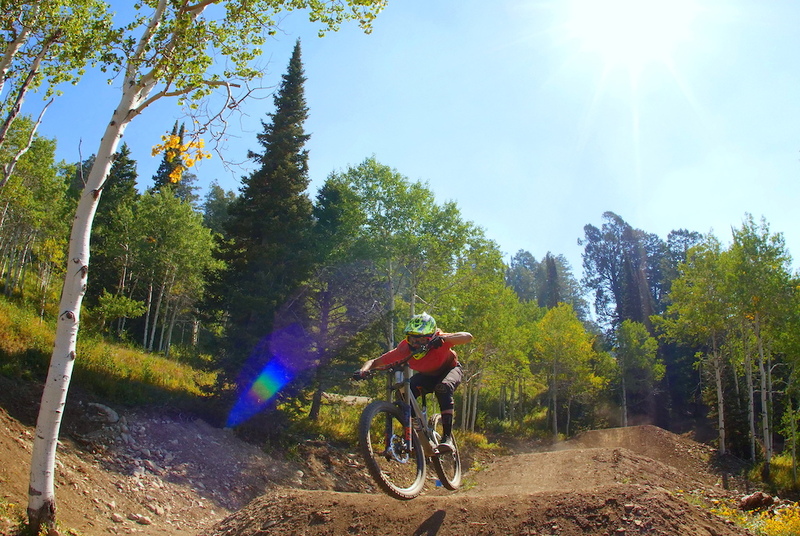 Each year Grand Targhee hosts the Teton Mountain Bike Festival that brings hundreds of mountain bikers together from around the country to raise funds for the Teton Valley Trails and Pathways. The festival features rides, races, parties and bike demos from several bike companies. For those looking for more amplitude, be sure to check out the new machine built jump line, Astro. Everyone loves riding amongst the quakies (aspens). Quakies trees are great moose habitat and belong to the willow family. They are Dioecious, which means every tree is either male or female. Dropping in for one last run from the top. Looking forward to sharing our next mountain bike destination with you all. Also, special thanks to Grand Targhee Resort, Profile Racing and Oakley.